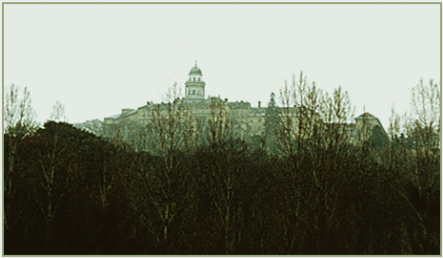 Archabbey of Pannonhalma, Hungary, 1978. The first year of Stanley Roseman's work on the monastic life, the artist and his colleague Ronald Davis traveled to monasteries in England and Ireland in the spring and summer of 1978 and in Belgium, the Netherlands, and Germany that autumn. In early November the two friends drove to Austria and followed the course of the Danube to the centuries-old Benedictine Abbey of Melk, where they were welcomed by Abbot Burkhard Ellegast, who offered them gracious hospitality and encouragement for their work. 2. The Benedictine Abbey of Melk, Austria, 1978. The majestic Benedictine Abbey of Melk, a splendid example of Baroque architecture with twin towers surmounted by onion-shaped spires and a great domed basilica, stands on a high plateau overlooking the Danube. The history of the monastery dates from 1089 when the Margrave Leopold II of Austria invited a community of Benedictine monks to reside in his ancestral castle of the Babenbergs at Melk. The ruler's heir Leopold III, Patron Saint of Austria and of the Abbey, was born at Melk. "Jonas and I shared a great interest in music,'' relates Roseman in writing about his work on the monastic life. "It seemed especially appropriate to be sharing such an interest with him at Melk, where music has long held an important place in the life of the monastery." From Roseman's work at the Abbey of Melk is the excellent portrait drawing Brother Jonas, (fig. 3, below), from the collection of Baroness Claude Homann von Herimberg, a gracious lady who generously donated the drawing to the Musée d'Art et d'Histoire, Geneva, which conserves an important collection of works on paper. 8. 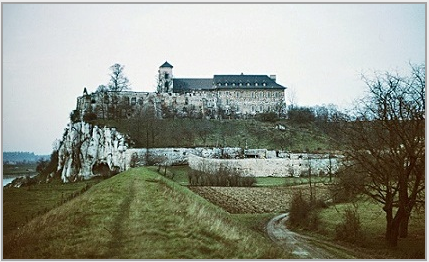 The Benedictine Abbey of Tyniec, Poland, 1978. The Abbey, located some 12 kilometers from Krakow, is situated on a limestone cliff overlooking the River Vistula. Also seen here are the remnant walls of the former monastery suppressed in 1817. Monastic life at Tyniec Abbey was restored in 1939. 4. The Benedictine Archabbey of Pannonhalma, Hungary, 1978.Pannonhalma is a stately monastic complex exemplified by Romanesque, Gothic, and Baroque architecture. The Prior Father Dominic Michalowski warmly welcomed Roseman and Davis and thanked them for having made the journey to Poland to include the monks of Tyniec in the artist's work on the monastic life. "The Prior's appreciation meant very much to Ronald and me," Roseman recounts, "as we wanted to extend the geographical scope of my work into Eastern Europe where monasticism is observed under the Rule of St. Benedict." Oxford University's Ashmolean Museum, housing a world-renowned collection of master drawings, conserves the fine Roseman portrait Brother Abraham, Tyniec Abbey, 1978, (fig. 10). "a fine drawing of Brother Abraham"
The Encyclopaedia of Oxford, edited by Oxford historian Christopher Hibbert, notes the Ashmolean Museum acquired the work of Stanley Roseman. Pannonhalma, founded in the last decade of the tenth century, is dedicated to St. Martin of Tours, born c.316 in the region in what was then the ancient Roman province of Pannonia. The first great leader in Western monasticism, St. Martin inspired generations of men and woman to follow an ascetic life of contemplation and prayer. Leopold III, who founded several religious houses, relocated the royal residence in proximity to Vienna and gave Melk and its surrounding lands to the monks. Over the following centuries, the Abbey of Melk flourished as a spiritual center, as well as a center of learning with the administration of a monastery school in the Benedictine tradition. Melk houses an important library which contains some 80,000 volumes, approximately 2,000 illuminated manuscripts, and 750 incunabula. "I learned that Beethoven's teacher the respected musicologist and composer J. G. Albrechtsberger was educated at Melk and later appointed organist at the Abbey and chapel-master of St. Stephen's Cathedral in Vienna. Mozart performed in the monastery's elegant reception room called the Marble Hall. In c.1949 a copy of Haydn's score Violin Concerto in A Major was discovered in the extensive music archives of the Abbey library. The composition has since become known as the 'Melk Concerto.' "
The portrait of Brother Stanislaw was one of Roseman's drawings presented in the color story on the artist in the Sunday magazine of Brazil's leading daily Jornal do Brasil. 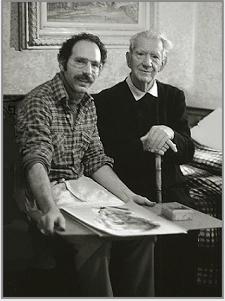 The enthusiastic reportage, published in 1980, speaks warmly of the partnership of Roseman and Davis and includes photographs by Davis of the artist at work and of monasteries in which they lived on their monastic journey. "Brother Florian had thoughtfully prepared a parcel of bread, cold cuts, apples, and cake for Ronald and me to take with us. He accompanied us to the courtyard, embraced us, and wished us a safe journey. Ronald and I expressed our heartfelt gratitude to Florian for his friendship and for the time he had given me for my work." Brother Stanislaw in Prayer was acquired in 1986 by the Museum of Modern Art, Rio de Janeiro, through the gracious intermediary of Dr. Nascimento do Brito, Publisher of Jornal do Brasil and President of the Museum of Modern Art. 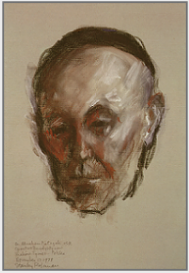 The portrait drawing in chalks on gray paper has a sculptural quality in Roseman's rendering of the middle-aged monk's strong, Slavic facial features and high, broad forehead under his black skullcap. The sanguine chalk gives a ruddy complexion to the face of Brother Abraham, who worked at various jobs out-of-doors in following the monastic precept ora et labora, prayer and work. Roseman writes: "I am appreciative to the Archabbot and to Father Richard for the wonderful tour Ronald and I were given of the monastery's great library, an imposing nineteenth-century neoclassical edifice that houses over a quarter of a million volumes, including illuminated manuscripts and incunabula. The abbey library contains the Charter of Foundation of King Stephen and a document in Latin from 1055, with the earliest written words in the Hungarian language. The picture gallery in the Pannonhalma library displays beautiful old master paintings by Bassano, Reni, Teniers, Adrian van Ostade, Gerard Dou, and Guardi." The Archabbot placed Roseman and Davis in the attentive care of Father Richard, the Abbot's secretary and a learned monk who was appointed the following year Director of the monastery's prestigious Secondary School and some years later, Prior of Pannonhalma. Father Richard saw his two guests well settled in the monastery and thoughtfully introduced Roseman to several monks who were to kindly give of their time to the artist. Father Xavier Szunyogh, a revered liturgical scholar, befriended Roseman and Davis, who occupied a room next to his in the cloister. 6. Stanley Roseman and Father Xavier Szunyogh in the Benedictine monk's room at the Archabbey of Pannonhalma, Hungary, 1978. On the artist's drawing board, next to his box of chalks, is the portrait drawing Father Xavier, (fig. 6, below), in the Royal Museums of Fine Arts of Belgium. "Father Xavier's room was filled with books, the kind of room I appreciate being in. Father Xavier said he understood English as a written language but had little practice in speaking English, so we spoke together in part through verbal communication and through the written word - that is, by jotting down on a notepad some of what we wanted to say to each other. The Musées Royaux des Beaux-Arts de Belgique - Art Moderne, Brussels, conserves Roseman's deeply felt portrait drawing Father Xavier, (fig. 7). With consummate draughtsmanship in portraiture, the artist expresses both outward appearance of the individual as well as inner being. and The Young Hermit Paolo in Choir . . . Brilliant white highlights illuminate the elderly monk's lean visage and white hair and accentuate the collar on the distinctive Hungarian Benedictine habit. 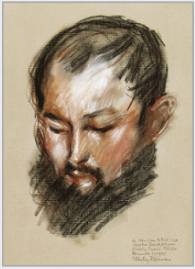 The reserved areas of gray paper impart a cool tonality to the skin tones complemented by warm shading on the monk's face. 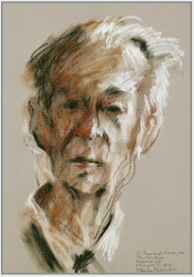 Roseman's vigorous modeling with chalks brings liveliness to the octogenarian's presence in the portrait, which poignantly reveals a sense of the man's younger, hardier years. "I showed Father Xavier slides that Ronald had taken of my work from England and Ireland, as that work was being kept for us at St. Augustine's Abbey. Father Xavier expressed great enthusiasm for my work on the monastic life, and he heartily thanked us for coming to Pannonhalma. "Father Xavier was fascinated that Ronald and I had journeyed to Lappland, where I painted a series of portraits of the nomadic Saami people, whose native language Saami belongs to the Finno-Ugric language group, which includes Hungarian. We showed Father Xavier large transparencies of the portraits, which he greatly admired. He said my work expresses a deep sense of humanity. Father Xavier's encouragement meant very much to me. Father Richard invited Roseman to give a drawing class to the students majoring in the fine arts curriculum at the monastery school. 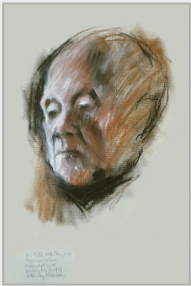 "I was delighted to do so,'' Roseman writes in his journal, "and honored when Father Richard graciously referred to my teaching as a 'master class' in light of the recent acquisition of my drawings by the Albertina. Father Vladimir, a pleasant monk whom Ronald and I met on our arrival at the monastery, kindly offered his services to translate my talk from English into Hungarian." "I taught a class in figure drawing. Ronald, who was in excellent physical condition from years of exercise at the gym, kindly modeled for my class, and I spoke to the art students on the subject of drawing. I emphasized the importance of drawing and cited Giorgio Vasari, the renowned, sixteenth-century Florentine architect, painter, and biographer, for whom drawing, in Italian 'disegno,' is the foundation of the visual arts, the animating principal of the creative process. I explained that Vasari founded the first drawing academy, Academia del Disegno, and that many artists in Florence during the Renaissance were dedicated draughtsmen. I told the students of my own dedication to drawing from my early career in New York City, and that drawings on a variety of subjects comprise a major part of my work as an artist. . . ."
At the Archabbot's request, Roseman and Davis prepared a showing of the artist's work. After dinner, in a common room set aside for the occasion, the monks gathered to view a selection of his drawings, which were greeted with appreciation and enthusiasm. Roseman, on behalf of Davis and himself, expressed sincere gratitude to Archabbot András and the monks for their interest in the artist's work and for their gracious hospitality. The portrait Father Xavier, (fig. 6, above), was reproduced in the Parisian daily La Croix, 1980, in an enthusiastic article on the work of Stanley Roseman. "He found again in the hospitality of the monasteries what he found in the Saami camps and under the circus tents. Is there not a profound relationship between the migrations of nomads, the voyages of traveling players, and the inner journey which is the contemplative life." "It is such a joy to see that you have not forgotten your stay with us - we remember it very well and often with Br. Florian talk about you and your work. . . .
"We may only congratulate you for such a gift which reveals a great inner richness scarcely found amongst mankind. Music is integral to monastic life from the ancient observance of chanting the Psalms at the Divine Office. Important monastic contributions to music include the innovative use of syllables for staff notation conceived by the eleventh-century Benedictine monk Guido of Arezzo. As well as organists and choir masters, members of monastic communities may include composers, musicologists, and players of different musical instruments. Brother Florian was a philosophy student at the University of Krakow to which he commuted for classes during the week. 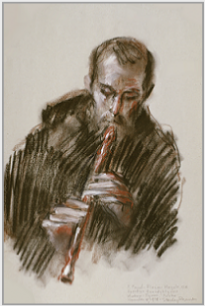 While the bearded young monk was engaged with his music on Saturday morning in the monastery, Roseman drew Brother Florian playing the Recorder, (fig. 11). Strong, rhythmic strokes of black chalk describing the black habit form a bold abstraction in contrast to the detailed rendering of the monk's face and hands in this superb drawing. "Father Dominic came to say goodbye to Ronald and me. The Prior thoughtfully presented us with a letter of recommendation, stamped with the Monastery seal. The letter he said was to show to the authorities, if necessary. Thanking the Prior very much, I asked him to please thank the Subprior Father Leon, Brother Florian, Brother Stanislaw, and Brother Abraham, as well as Father Bernard, who had kindly provided Ronald and me with a history of the monastery. Ronald and I expressed our deep appreciation to the Prior for his cordial invitation and his encouragement of my work on the monastic life. Brother Jonas' striking appearance in the Roseman portrait reminds one of representations of St. Leopold of Austria in illuminated manuscripts, stained-glass windows, and Renaissance paintings in which the saint has shoulder-length hair and a full beard, often blond in color. In the portrait of Brother Jonas, beige paper imbues the composition with a blond tonality. The artist's range in the use of the chalks combines broad, painterly strokes of bistre with fine lines and tonal passages. 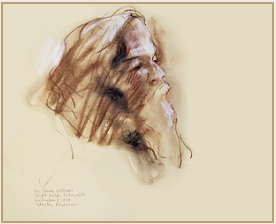 The white chalk renders highlights on the monk's face, hair, and beard, and with contrasting bistre chalk, adds effects of spacial dimension. The chiaroscuro modeling of the chalks brings cool light and warm shading on the face of the Polish, Benedictine monk, who kindly gave of his time to the artist. Father Xavier initiated in Hungary in the 1920's the Liturgical Movement, which brought greater participation for lay people in the liturgy of the Church. The Liturgical Movement reached a milestone with the Second Vatican Council (1962-65) that legislated the use of the vernacular for the Mass. Father Xavier translated the Gospels and the Roman Missal into Hungarian. The erudite monk also translated into his native language other religious and secular literature, including novels by Charles Dickens. A related work to the Geneva portrait is Brother Jonas in the Calefactory conserved in the Los Angeles County Museum of Art. The equally excellent drawing is presented on the website page "Ora et Labora - Prayer and Work" - Page 2 "Daily Life in the Monastery." Travel in the 1970's was restricted between Western and Eastern Europe. Moreover, in the events following the Second World War, most monasteries were closed in the Eastern bloc countries. At the Hungarian Embassy in Vienna, Roseman and Davis presented the letter of invitation from the Archabbot of Pannonhalma, the only monastery permitted to remain active in Hungary. Pannonhalma, a centuries-old monastic center of learning, gave refuge during World War II to people regardless of their religion. At the Polish Embassy, Roseman and Davis presented the letter of invitation from the Prior of Tyniec Abbey, near Krakow. 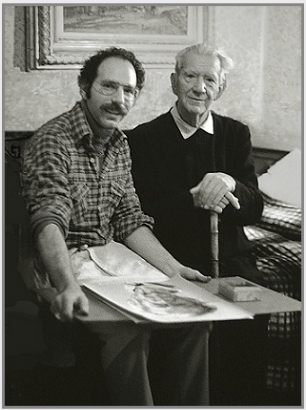 The artist and his colleague showed the authorities information on their work and exhibitions, including the laudatory review The New York Times and a reportage from Tass News Agency, which wrote: "The citizens of New York have the opportunity to see an exhibition of paintings and drawings on the performing arts by the talented American artist Stanley Roseman." With visas kindly granted from the Hungarian and Polish Embassies and a transit visa from the Czechoslovakian Embassy, Roseman and Davis departed from the Abbey of Melk, crossed the Austrian-Hungarian border, and drove on to the Archabbey of Pannonhalma. "Brother Péter Márton was the first monk I drew at Pannonhalma," Roseman further recounts. "I am grateful to him for providing me with the opportunity to begin my work in the monastery, more so as the kindly monk had the name of St. Martin. Brother Péter Márton, a man in his senior years, encouraged me in my work on the monastic life, which established a rapport between us. I drew him in his room on two occasions and was very appreciative of the time he gave me. The Szépművészeti Múzeum (Museum of Fine Arts), Budapest, which houses a world-renowned collection of master drawings, acquired the impressive portrait drawing Brother Péter Márton, (fig. 5), and an equally fine portrait of the Benedictine monk. In cordial correspondence in 1987 to Davis to thank him for offering a gift of Roseman's work, Dr. Ferenc Merényi, Director of the Szépművészeti Múzeum, writes: "We would be very pleased to have two drawings from Pannonhalma by Stanley Roseman, the ones representing Brother Péter Márton." In a warm letter to Davis to acknowledge receipt of the drawings, the Deputy Director Dr. Miklós Szabó, art historian, archaeologist of Celtic and classical Greek antiquity, and university professor, writes to express the Museum's gratitude for "the two beautiful portraits." In 1001, St. Stephen, first king of the Hungarian nation, consecrated the basilica of Pannonhalma. The Benedictine Archabbey of Pannonhalma rises atop St. Martin's Hill in the Gyor-Sopron region of Western Hungary. Early inhabitants of the region were Celtic tribes that migrated to the central Danube valley in the fourth century B.C. 1. P. Reginald, Stift Melk (Munich: Verlag Schnell, 1968) pp. 1, 2. 3. Genava. LII, 2004: Revue d'histoire de l'art et d'archéologie (Genève: Musée d'Art et d'Histoire, 2004) Vol. 52, p. 356. 4. See the scholarly publication by Miklós Szabó, The Celtic Heritage in Hungary, (Budapest: Corvina, 1968). 5. David Katalin, Pannonhalma (Budapest: Corvina, 1968), pp. 9, 10.
where the exhibition opened its American tour. 7. The monks of Tyniec Abbey kindly provided Roseman and Davis with a history in English of the monastery. 8. The Encyclopaedia of Oxford, ed. Christopher Hibbert (London: Macmillan, 1988), p. 40. Brother Stanislaw in Prayer, (fig. 9), is rendered with a painterly use of the chalks on gray paper. In the portrait the young Polish monk's head is inclined, his eyes closed, his fair complexion in striking contrast to his dark hair and beard. A draughtsman of technical virtuosity, Roseman has created here a compelling image of a young monk in meditation and prayer. A strong, northern light illuminates the face of the ascetic monk who is depicted here absorbed in thought. The artist's chiaroscuro modeling and fine gradations of light and shade, or sfumato, in the rendering of the Benedictine monk's facial features are complemented by linear description and transparent, warm tones in the drawing. The monk's high, black collar and the dark background that closely follow the contours of the face and forehead set the portrait in pictorial space. Roseman has created an intimate portrait of Brother Péter Márton, who is following an ascetic, contemplative life inspired by the Saint born in the region of Pannonia.